The type of oil you use is dictated by personal preferences and intended use, as is the type of butter or wax you use to thicken it. There is an ever-increasing number of exotic oils and butters available and they will all work equally well dissolving the resin portion of Frankincense. The amount of Wax or butter to add can be as little or as much as you like. I usually add just enough to keep the salve in the tin and on the skin for a good period. 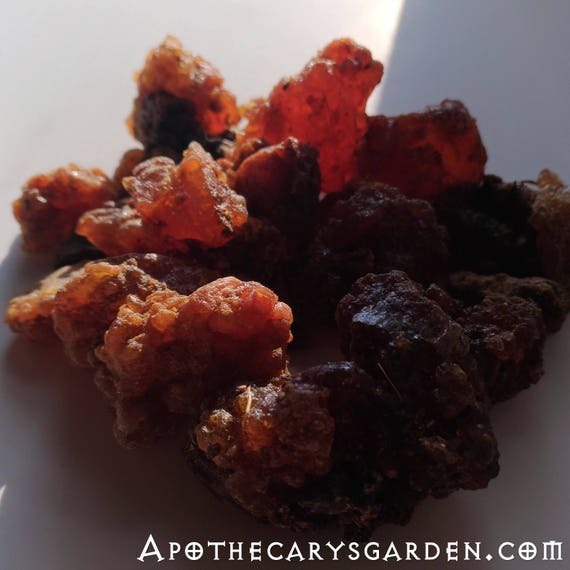 The trick with working with Frankincense is understanding that it is an oleo gum resin, has both a water-soluble fraction, (the gum part), and an oil-soluble fraction, (the essential oils and the resin), and that it is the oil-soluble oleoresin that we want to isolate for this application. There are two methods I use to create a Frankincense salve. The first is by creating an oil extract or infusion of fresh frankincense in a carrier oil of my choice. 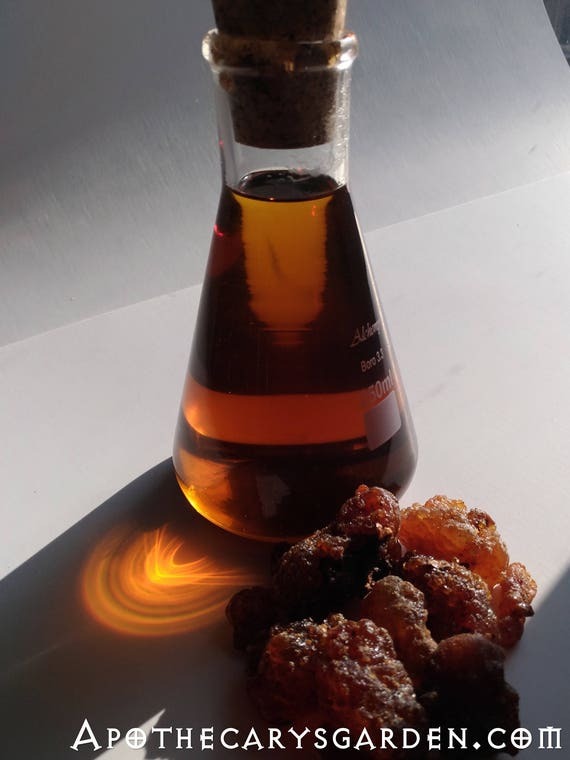 (See the post-How to make an oil extract of Frankincense and other oleoresins). The second is by making a resin extract of Frankincense and dissolving it in warm oil as a base for a salve.-(As in the post-How to extract the resin and Boswellic acids from frankincense). Both will create wonderful healing and fragrant products, but today I will focus on making a salve from the oleo extract. If you want to deliver Boswellic acids with your salve, you can choose from the 4 Frankincense types that have been shown to contain these healing compounds. I will reiterate here that there are little to no Boswellic acids in the essential oil of Frankincense. The Boswellic acids, AKBA , and other resin acids are only present in the resin portion of these oleo gum resins. Though all essential oils have therapeutic properties, you will not harness the full therapeutic potential of Frankincense unless you work with the whole oleo gum resin or the oleoresin portion. When preparing a hot oil infusion or extract of Frankincense, we will powder the Frankincense granules to expose as much of the oleoresin as we can to the oil. This can be done using a mortar and pestle or coffee grinder. In both cases, we need to spread the powder out and stir it periodically for an hour or so and allow the newly liberated moisture to evaporate. When we grind oleo gum resins, we release up to 10% moisture that has been locked in the gum since the day it bled from the tree. Once the powder dries it will stay loose in a sealed container and will not clump when compacted in capsules. (See-Instructions for grinding Frankincense, Myrrh and other oleoresins). Stirring the fresh frankincense powder to keep it loose while it dries. Powder and dry the oleo gum resins. Place the powdered material in a pot, jar or bowl in the water bath. Add a carrier oil of your choice at a minimum ratio of 1:3 by weight. This means 30 grams, (1 ounce), of powdered resin to 90 grams, (3 ounces), oil of your choice. Depending on your application or the amount of Frankincense you have on hand, you can, of course, make an efficacious product with a higher ratio of oil. I prefer to work with a ratio of 1:3 or 1:5. Bring the bath to a boil and keep it on a low simmer for 3-5 hours stirring occasionally and adding water to the bath periodically if needed. Remove the jar/bowl from the heat, let it sit and sediment a couple of hours, a day or overnight. You can let it sit much longer and many people do so for a full lunar cycle or longer when potentizing more complex medicines. After the undissolved particles have settled to the bottom of the jar, pour the oil through a filter, separating them from the oil. I use a metal mesh coffee filter to separate the undissolved water-soluble granules from the resin-infused oil. If you don’t filter it, you will have a gritty, grainy salve that will feel more like a greasy exfoliant than a nourishing healing salve. If desired, a finer filtration is possible using the corner of a pillowcase or a paper coffee filter. A simple water-bath system for processing larger quantities. A steel bowl sitting snugly on a pot of water. The insert. A perfect match for the water bath. Aesthetics are an important element in all forms of artistry. If you are using a paper coffee filter, keep the sediment out of the filter till the very end, otherwise, it will clog the paper and the process will take much longer to complete. Another trick to filtering through paper is to heat the infused oil in the water bath before filtering. Hot oil is less viscous than cool oil and will pass through the filter paper more quickly. Once you have a filtered fragrant clear oil, back to the water bath it goes. Beeswax added directly to hot oils. Cocoa butter added whole to hot blend. Filling tins with measuring cup. Elegant in its simplicity, the Bain Marie, or water bath is a sophisticated piece of ancient technology. It is a precise and reliable thermoregulator that works as flawlessly today as it did a thousand years ago when knowledge of its use was reserved for initiates of the secret and sacred arts. The Bain Marie is not named after a person, but a principle. And I will leave the pedagogy at that for now. As the water in your Bain Marie boils, the wax/butter and Frankincense oil will melt together. I like to give them time to heat thoroughly and sit together at the highest temperature for a while to bond. Don’t rush them. To test the consistency of the mix, I place a few drops of salve to cool on a plate or piece of tinfoil at room temperature. This way I can gauge its current texture and fine-tune the product by adding more wax, butter, oil or any other ingredient that I have incorporated in the formula. When the drop test yields a product you are happy with, remove the salve from the water. You noticed I didn’t give you a recipe or precise proportions for the waxes or butters in your salve. I am going to let you add these ingredients in small increments, testing the results often till you are happy with the texture, consistency, and fragrance. This is an excellent introduction to your materials and where you make your product uniquely your own. To do this properly and be able to keep accurate notes on what proportions worked best for you, pre-weigh the containers holding your waxes, butters etc. When you have created the product that pleases you, weigh the partially emptied bowls and tally the difference which is what went into your product. Write it down in your formulary for future reference. If you have essential oils you would like to add, now is the time to stir them in as it cools down. I keep essential oils to under 2% for safety reasons. Remember, you already have the aromatic volatile compounds from the oleoresin in their natural proportions. Sometimes, it can be tempting to overdo it with therapeutic essential oils. I usually find it is more satisfying to keep both the aromatic profile and the therapeutic qualities of the oleoresin front and central and only add essential oils with a light hand and an eye for harmony in fragrance and function. Resins deliver a broad spectrum of therapeutic compounds and come with their own “custom-made” essential oils. There is no doubt essential oils can provide a supportive role in the finished product, but I have found it is usually best to use a little less rather than a little too much. Once your essential oils are blended, pour the hot liquid into containers and let it sit undisturbed till it is well solidified. I often use a plastic measuring cup that has a handle and a spout for ease of use and minimal spills when filling tins. 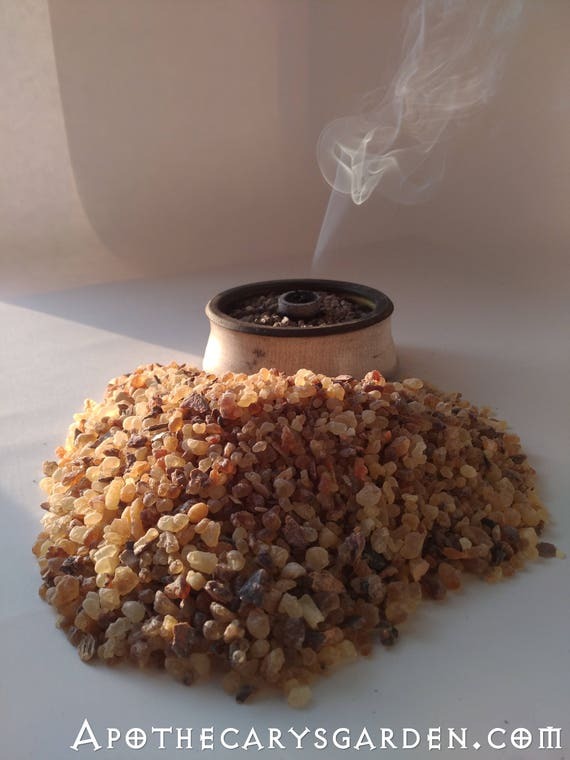 I started writing this post because a reader left a comment asking if she could combine Myrrh in these Frankincense formulas. I got a bit carried away, but I didn’t forget. The answer is YES. You can powder Myrrh and combine it with the Frankincense powder for your oil extract. From there it is easy to make a salve as described above. More than this, there is a special synergy between these 2 trees and their oleoresins. They are known to not only compliment each other but boost each other’s therapeutic qualities when compounded together. In the plant kingdom, Frankincense and Myrrh have a unique bond, resonance, and a polarized symmetry unlike any other 2 plants I know of. Given time I will write more about this. So. Have fun and remember to take clear notes. Next Post: Civet perfume & Coffee. A call for community involvement. When you say myrrh do you meet myrrh proper or opopanax? I’ve read a few things that have confused me a bit, specifically that opopanax is the sweet myrrh mentioned in the Bible and the one with better health benefits. When I say Myrrh I am referring specifically to Commiphora Myrrha. I usually name the other members of the Myrrh family by their Latin names or call them “Sweet” or “Scented” Myrrh. Also, another name for C. Myrrha resin is Herabol Myrrh, while the others are named Bisabol Myrrhs. There are quite a few aromatic resins from the Myrrh family and most of them are called Scented Myrrh. We assume the reference in the Bible to Sweet Myrrh is to Commiphora Guidotti, AKA Opoponax, but it could very well have been one of the other aromatic Commiphora resins. Since the resins themselves have a shelf life of decades if stored properly, it is the other ingredients we add to our products that can shorten their shelf life. The carrier oils we use are likely have the biggest impact. While fractionated Coconut oil and Jojoba are stable and will not oxidize or go rancid, other oils such as Grapeseed, Olive, Almond and many others can spoil within a year or two. Adding Vitamin E to these oils will extend their shelf life another year or two. Resin products made with Fractionated Coconut oil or Jojoba can last at least10 years, (So far, in my experience), if stored in a cool dark place. Thank you Dan for sharing your skills and knowledge. I am a self taught naturalist, soap maker dabbling in herbal skincare. I found you looking for information on the best methods for making oil extractions of the pine/spruce/fir sap I collect … all I can say is WOW, I found you! I already make and use infused oils with things I collect from the forest like Plantago Major, wild Geranium, Wild Rose petals, Cottonwood buds, yarrow, calendula and others. I just ordered your Frank powder and Myrrh resin and look forward to experimenting with these! I read on the blog yesterday about combining the synergy of including salve Frank, Myrrh, and Pine resin into an infused oil for making salves and was wondering if you can elaborate more on that topic? Thanks in advance Dan! There is indeed, in my experience, a very special relationship between Frankincense and Myrrh. I have a half written draft that I should finish and publish which explains this relationship in some detail. There are many hints in their growing habits, chemical and aromatic profiles, and their therapeutic qualities. From an astrological perspective they not only embody many of the characteristics of their ruling planets, Sun and Moon, but echo the dynamic relationship between them. I know of no other plants that share such a deep and archetypal relationship as Frankincense and Myrrh. Worth every minute studying the old ways. Thank you! THANKS for all your sharings and I am learning much from your blogs. Heat destroys some properties of the coldpressed oil used. Can you explain how it would affect the end result of the product? What is your opinion of infusing ground resin in coldpressed oil for many weeks and store in cupboard like plants/flowers infusion method? Also, can resin be swallowed after chewing it or after melting it on our tounge for oral health? From what I gather, cold pressed oils will start to break down or deteriorate when they reach their “smoking point”. This is different for each type of oil and can be anywhere from 350 to 450 degrees Fahrenheit or 175-240 degrees Celsius. There are however more temperature sensitive compounds in some oils like Chlorophyll which will be lost at temperatures of over 140 Fahrenheit or 60 degrees Celsius. I suggest doing some research on the particular cold pressed oil you are using, the different therapeutic compounds, and the temperature each will tolerate before it starts deteriorating. That should give you an idea of how high a temperature you can use in your oil/resin infusion. Cold infusions do not work well for resins in my experience, no matter how long they sit. There is a “marriage” that happens between the oil and resin when the resin melts which will not occur at room temperature. Most of the resin compounds will melt and dissolve in the oil at around 60 C /140F . Once you have an understanding of the heat tolerance of different compounds in your cold pressed oil, you can gird your self with a thermometer and keep an eye on the temperature of your oil. If they will tolerate temperatures of up to 60 Celsius, you may have no problem making the infusion. Regarding your other questions, swallowing chunks of resin likely has little health benefits. I believe it will mostly pass through your digestive tract intact. A powder of Frankincense resin will be much more effective and be more easily absorbed by the body, especially when taken with food. Thank you Dan for this nice explanation . I’ve been infusing frankincense in oil , using your method, for a while , with great results. I am experimenting with something else , adding flowers to the frankincense infusion , basically infusing flowers and frankincense in the same time. For example I would add rose buds(can be also powdered) , and powdered Papyrifera (which has a very light scent because of low percentage of essential oils) . I like the results . …I also infused Carterii and lavender flowers, papyrifera and chamomile. Wow, what beautiful combinations Sorin! Thanks for the recipe and pics, Dan! It is always a pleasure to read you, I will try the 2 formulas: with resin extract and with Myrrh / Incense reduced powder ….. I will see which of the 2 I like the most. Have a good day! Thanks Cathy. Sounds like a solid plan!.